Whenever any body asks me the Mantra (key) of my success, what ever little, I have achieved in my life, the answer starts from my Mother Smt Shanti Vyas. I do ‘puja’ every day in the morning and before bowing my head down before the God, gets assured that I am having blessings of my mother. My mother is not armed with academic degrees. She may be illiterate but certainly an educated woman. I have seen her putting all her energy and meticulously using the resources whatever my salaried father Sh. J. S. Vyas (an officer with Dept. of Posts) could arrange for her four sons and two daughters. She was a true teacher for all of us in real sense and never allowed us to sit idle. She was having zero tolerance towards the discipline during our student days. It is but because of hard work that my father could discharge his family and social obligations successfully. We all brother and sisters are leading happy life in different parts of the country and all credit goes to her. Out of my three brothers, two are renowned medical officers and one is Dy. General Manager in Adani Group. One of my sister (topper of Banasthali vidyapeeth), who was college lecturer is now having her own Sr. Sec. School in Jaipur. The heart touching quality of my mother is that she equally loves her daughter in laws. My wife Dr. Saroj Vyas did all her higher education on her inspiration and is now Principal of an educational Institute (FIMT, Kapashera) affiliated to the Indraprastha University, Delhi. Another daughter in law Smt Teena Vyas, Advocate has passed the District Judge Cadre Exam of Rajasthan Higher Judicial Services and is appearing in the Interview this month. To all of us, she is a living legend and Goddess. We needs are constant blessings. 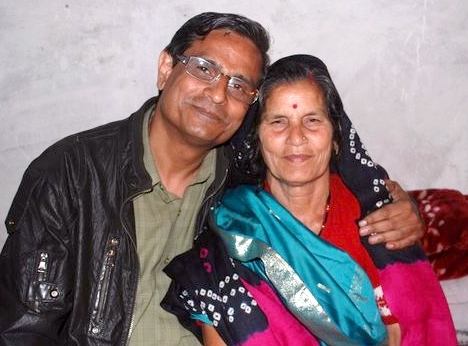 Many people who are religious in nature, often asks me, the name of my ‘Guru’ and I say to me, my mother is my Guru. How other than her, could take this pious title. I am loyal to my mother, that is how, I am always ready to make supreme sacrifice to my mother land, my country, India.